This hard shell case's exterior is made of a dense injection ABS composite plastic for superior external protection against blunt forces, drops, dings and other unforeseen mishaps that can damage your valuable smartphone mods. Interior protection consists of an airtight rubberized lining and impact resistant padded foam . With the combination of a highly durable exterior and dense foam interior, you can be sure your moto mod speakers , batteries , projectors and printers have reliable storage and protection. The closure system consists of metal-hinged latch that snaps down securely. Additionally, the rubber internal lining creates an airtight seal that protects your electronic device against water splashes, spills and moisture. This hard shell case fits ONE Moto Mod and is great for packing inside of backpacks, , under car seats and in other discreet storage areas. Measuring 6.5" x 5.0" x 2.0" in exterior dimensions, and internally fitting Mods with maximum dimensions of 6.2" x 3.2" x 1.00". This case is perfect for on-the-go traveling or storage in small spaces. 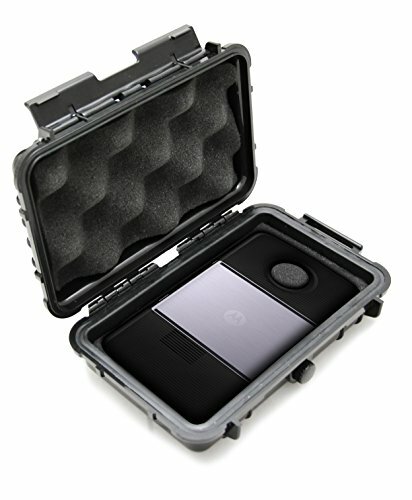 The inside of this case has a dense foam lid and rubber bottom to absorb impacts from drops . On top of the rubber bottom are two flat foam layers that can be added or removed so the foam lid holds your device . This prevents movement within the case and reduces vibration that can damage internal components.